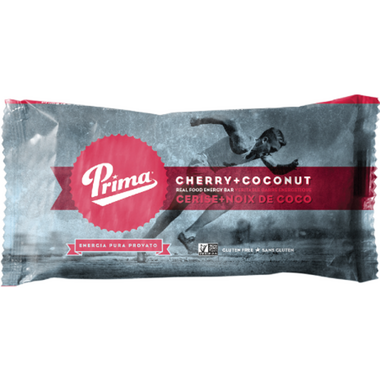 Prima Real Food Energy Bars are handmade in Vancouver, BC with whole food ingredients. Cherry + Coconut is one of our most popular flavours, combining tart British Columbia cherries with rich coconut to create a nut-free energy bar that tastes great anytime. May contain traces of tree nuts and peanuts. Made by hand with real food, Prima bars may contain occasional shell, pit, or stem fragments.